I thought, how’s that possible with size 2 Kb only to check security vulnerabilities? May be it uses some web service for that? What critical data plugin sends to external site then in order to make security test? So I went through the code and discovered that there is no any real or potential vulnerabilities checking in the current version of plugin. May be WP Sanitize plugin is still in developement? According to its site vibethemes.com author plans to add some new features for this plugin. If such, plugin description should include this information. 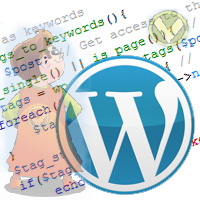 Not all WordPress blog owners can look inside PHP code and check the real plugin functionality. 1) Remove RSD (Really Simple Discovery) link from your WordPress blog pages header. What is it? Really Simple Discovery (RSD) is an XML format and a publishing convention for making services exposed by blog, or other web software, discoverable by client software. Any other critical settings should either be defined in the RSD file related to the blog, or discoverable using the information provided. from your pages. What information you can hide removing this link? The other side is that there are a lot of stupid low level software bots which surfs Internet and searches easy victims. So in case you are the only user of your blog that’s more secure to hide as much information as possible. In this case this option could be useful. 2) Remove Windows Live Writer link. That could be seemed more critical as included link to your ‘wp-admin’ your WordPress blog administrator back-end script location. But again, if you know that this blog uses WordPress, is that a big secret, that the most of WordPress blogs has their administrator back-end script at ‘wp-admin’ directory? Of course, No. Thus, is you have large number of contributors, why limit them from using external clients they prefer to work with your blog? Again, there is other side. If you the only user, that could be useful to hide as many information about your blog as possible. You never know, what malicious bot will visit you tomorrow, and may be this small security related enhancement escape you that time. 3) Remove the version number. You can hide it activating this option. Why is it more secure do not show you blog version? Getting WordPress version hacker or software bot could use vulnerabilities known for that version. From other side if most of us always use the latest WordPress version (as it should be), is that a big secret for intruder what WordPress version do we use in this case? If you are security paranoiac (as me :)) you will hide your WordPress version. This option turns off WordPress feature which makes some automatic replacements in your posts and comments texts. Simple quotes replacement to curly quotes is one of them. With latest WordPress versions I don’t know why you should wish to turn it off. WordPress don’t changes quotes now inside special tags, e.g. And finally, what relation this option has to security? This option turns off WordPress built-in control (wp-kses filter) and allows to your blog users input raw HTML code into their profiles. 6) and final option is “Optimize Database”. I was very curious what does it mean really: “Keeps WordPRess database Optimized”? May be it realizes some functionality similar to WP Optimize WordPress plugin? When I checked plugin source code I got an answer. It is not WordPress database optimization. It is MySQL database optimization with MySQL “optimize table” command. Is mentioned above “extensive changes to a table” applicable to WordPress? Do you delete large part of WordPress data often? What extensive changes to a table could take place in case of WordPress blog? Any users activity just adds new records to your database. Large post update operation? May be. But if you make one post a week and have less than 1000 records in your wp_posts table, why do you need to execute ‘optimize table’ command for all tables of your WordPress MySQL database on the daily base? Yes, plugin automatically adds this operation to WordPress scheduler interface with ‘daily’ execution period. I think, that this has to be an option. Plugin user should decide if he needs scheduled database optimization and how often this operation should be executed. Finally, digging Internet before make this post I found this article Your First WordPress Plugin: Simple Optimization. It was published at on May 31st 2010. WP Sanitize plugin is published at wordpress.org plugins repository on October 23rd 2011. Compare functionality. Open wp-sanitize.php file in any text editor and compare code snippets with those in article. Very similar? Options management page is added, SEO related staff is excluded. That’s all. Nothing new and nothing changed. Yes, we can re-use any code published under GPL license in our work. But I don’t see any mention of the former code author Jonathan Wolfe and primary source site link in the WP Sanitize plugin’s materials. Is that correct? What do you think? This entry was posted on Sunday, October 30th, 2011 at 00:55	and is filed under MySQL, WordPress. You can follow any responses to this entry through the RSS 2.0 feed. You can skip to the end and leave a response. Pinging is currently not allowed.